According to John Willis and Herb Lonsing, the AMF 660 Vee-Berth Cabin is one tough kiwi that’s up for just about anything. The 660 Vee-Berth Cabin is part of AMF's Pro Sport Series of alloy offshore machines, manufactured at the company's facility at Wanganui. AMF describes the boat as featuring a warped planing hull with small reverse chines. AMF's hulls are relatively full bodied and I had a gut feeling the 660 Vee-Berth Cabin was going to be good. This boat is by no means the cheapest alloy hull on the market but it's as solid as the proverbial brick outhouse. 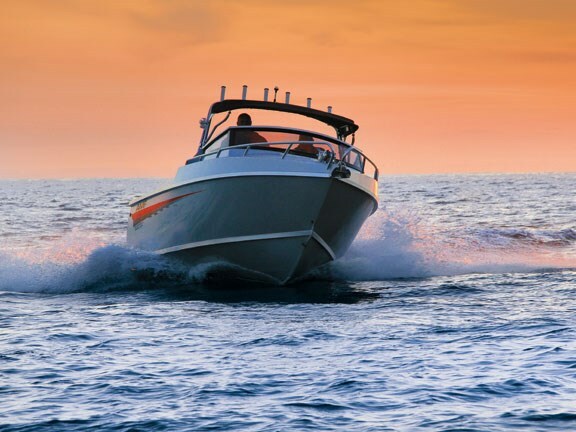 AMF's core business is producing commercial boats for the domestic market – boats that often operate in challenging conditions where beach launches and bar crossings are commonplace. The company doesn't build small boats, either: its range starts at 5.8m. 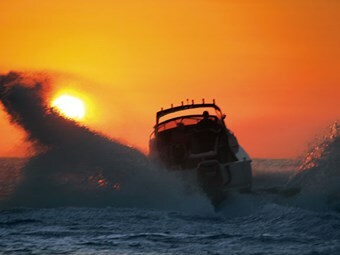 While the Pro Sport Series of alloy boats is built to commercial construction standards, these vessels still reflect sound recreational design principles. The 660 features a 6mm hull with a 5mm transom and tread-plate floor, as well as 4mm sides. The keel and chines are fully welded inside and out and there are seven full-length longitudinal supports. The quality of the continuous welding is spot on and it's left unground without a hint of an error. The general finish is quite impressive and it's said the 'Nyalic' acrylic coating can be easily repaired and is a harmonious match with aluminium, which is generally a fairly temperamental material. This finish is also used by Surtees, among other builders, and it seems to be a decent alternative to two-pack paint. The package looks quite smart and is complemented by simple but stylish decals. The AMF 660 features closed buoyancy chambers for safety (but no foam), while AMF says all of its Pro Sport Series boats are prewired at the factory with isolators and fuses, according to European CE standards. The cabin has narrow side decks but Russell Cairns demonstrated how simple it was to walk around to the checkerplate deck in calm conditions. I thought we'd leave that manoeuvre to him as I preferred the comfort and security of the cockpit. The use of checkerplate on exterior surfaces presents an image of armour-like strength. Whether the reality of that is true or not, on a practical level the textured surface does at least provide a bit of additional grip. Stability is excellent. I was 30kg heavier at the time of this test than I am now (yep, the diet's working) and even with myself and Cairns leaning over the side, there was only a slight list. The transom steps are completely filled in, providing extra planing surface on take-off as well as increased buoyancy at rest under the weight of the big 200hp Yamaha four-stroke. The pod seems very strong and easy to fish, while the power-to-weight ratio felt just right. The test boat was supplied with a Voyager tandem trailer. It's a premium multi-roller, drive-on tandem that matched the boat well. The biggest difficulty faced in reviewing this boat was finding something to criticise. The cabin's locking mechanism is a bit 'agricultural' yet it's still effective. It essentially comprises a removable aluminium hatch that's aligned into the doorway and then locked into position. It's probably best left at home or in the car when fishing but it's actually quite practical for the style of boat. It's also devoid of the rattling and slamming issues of a permanently fitted door, while still providing full security when required. The vee-berth itself is simple and allows sufficient room for overnighting as well as storage. There's reasonable head height even with the low-profile cabin – the latter giving little in the way of wind resistance. The windscreen has an appealingly strong framework, although it's not as aesthetically attractive as most other bolt-on options. However, overall there was plenty to like in the AMF 660. It's filled with those simple little things that count. The 660 isn't overly trim-sensitive and it liked to be driven with its nose a little high. With this level of trim, tight turns would understandably cause cavitation but the AMF 660 was considerably better than many of its competitors in this respect. I deliberately gave the package a hard time in and out of the surf in an effort to find fault but couldn't find any. Herb Lonsing was with me on the day and even managed to fling Cairns out of his chair when he forgot to grab hold during a tight manoeuvre – but that was Cairns' fault, not that of the boat. Grabbing hold of the optional folding rocket launcher or dash rail would have been a wise move. 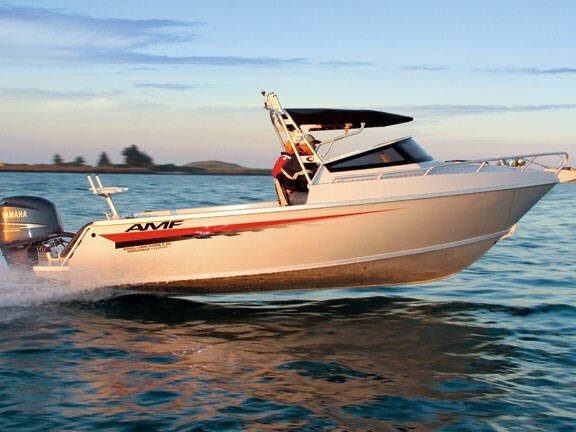 AMF says its boats boast extra strength in the bow and we tested that claim. It cuts with the power of an icebreaker. We tackled the surf with absolute confidence; in general, I'd say this is a reliable, dependable and responsive offshore machine any of us would be proud to own. Fishos demand a large, flat dashboard for all of their required instruments, tackle, communications equipment and personal gear. My wife calls me a 'flat space bloke' as soon as she clears a bench top, I tend to cover it up with stuff again. Fortunately, there's no shortage of dash space on the AMF 660 and the alloy retaining strip that prevents loose items rolling off the carpet-lined dash was a nice touch. Hydraulic steering delivered responsive control and there are grabrails and handholds aplenty. The upholstered plastic pedestal seat is appropriate and reasonably comfortable and the seating position and helm layout places everything right where it should be. Forward visibility is restricted a tad by the windscreen and rocket-launcher frame but this trade-off can be excused for the strength and practicality it supplies. AMF's Pro Sport Series 660 Vee-Berth Cabin is quite pricey when you draw comparisons and if budget's your prime concern then look elsewhere – this ain't your boat. However, if you're on the hunt for a premium offshore alloy workhorse you should seriously consider test-driving an AMF 660. In my view, this is one of the best-constructed alloy boats on the market, with the ride and layout to match. I believe the quality of construction, materials, design and on-water performance are commensurate with its price. 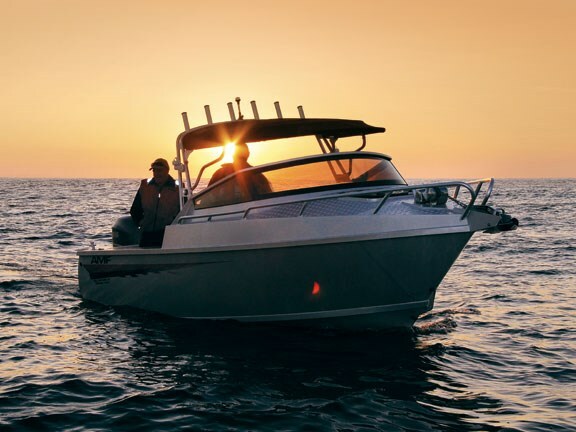 The hull's 10-year recreational-use warranty says it all. 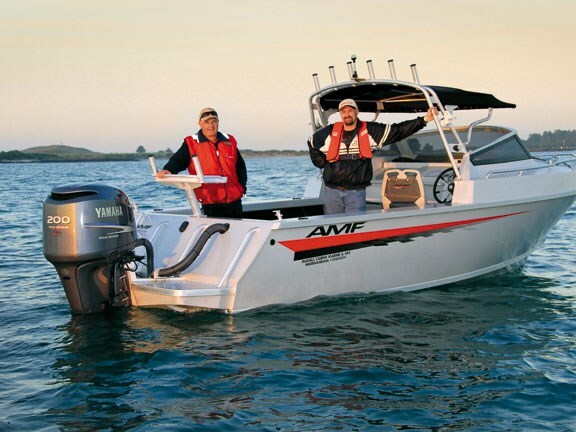 For more information contact AMF Boats, ph 06 345 8513 or visit amf.co.nz. Find AMF's currently for sale here. Feel free to make a comment or ask us a question about this story on the Trade A Boat page. For the latest reviews, subscribe to our Trade A Boat magazine here.